The dining room of the old Bellevue Hotel, that hostelry so famous in Wayne in the last two decades of the 19th century, was a spacious room in the center of the building. Its wide doorway was at the end of the hallway that led from the main entrance, which faced on Lancaster Pike. From its windows, looking to the East and to the West, guests could see spacious, well-kept lawns, flower gardens, shrubbery and trees. There were several good tennis courts on both sides of the building and space for that other, if less strenuous game, croquet, so popular among young and old alike at that time. Saturday nights were gay times at the hotel, with “hops” held each week in this big dining room. These were for the “dowager mamas” who sat chatting throughout the evening as they watched the young people dance by. These hops were mainly for the guests of the hotel, although a few cards for outsiders were issued through the office. From 8:30 until 11:30 the small orchestra played waltz and two-step music. But promptly at 11:30 the party stopped, and by 11:50 guests who were Philadelphia bound were at the railroad station to catch the last train. Twice during the summer “Germans” were given. They were very formal affairs with the girls in their most beautiful evening dresses and the men in their “tall coats”. Favors were in the form of small silver trinkets. And since these were very special occasions, punch was always served. The “Mikado” parties were events long to be remembered in the annals of the Bellevue. Two of Dr. Arms’ pictures show the women guests of the hotel grouped on the porch, all of them dressed in handsome figured kimonos tied around the waist with wide sashes, each with her fan and paper parasol. Their hair is dressed in true Japanese fashion and ornamented with large pins. A great deal of time and money was spent on their costumes, according to Mrs. Davis, who adds that “the women looked very beautiful”. But the Fourth of July celebration was the really grand one of the gay summer, for which plans were made long in advance. There were many sports events for all of which prizes were given. in the morning the potato races, bicycle races, and competitive games of quoits and croquet took place. In the afternoon came the big baseball game, guests versus the waiters, always a jolly event. At one o’clock dinner was served. Again we could wish that some of the menus might have been kept. The menu cards themselves, Mrs. Davis describes as “specially embossed” and listing “the finest foods and delicacies”. Many guests always kept their private supplies of wine and champagne on their porches, and for this big event of the summer they drew on these supplies. For old and young alike souvenirs were provided. in the evening there was always a more than usually pretentious hop with a large orchestra to furnish the music. And last but not least, there were Fourth of July fireworks. Part of the hotel was partitioned off in winter to keep the rest of it warmer and more cozy than it might otherwise have been. Ordinarily there were about 50 guests staying there during the cold months. one season the most distinguished early winter guest was Frances Hodgson Burnett, author of “Little Lord Fauntleroy”. At that time she wanted to be near Philadelphia long enough to consult Dr. Solis Cohen, a famous throat specialist, before she set sail for England. However, it was a trip she was not destined to take, for Dr. Cohen advised her that Lionel, her elder son, was too ill with tuberculosis to stand the voyage. In addition to Lionel she had a younger son, Vivian, with her at the Bellevue. Vivian was the hero of “Little Lord Fauntleroy”, Mrs. Burnett’s well-known book. While the children evidently were not in the forefront of life at the Bellevue, there were always large numbers of them there with the parents at all times. One of Dr. Arms’ pictures shows a large group of these youngsters of the 80’s or 90’s. The girls all have long straight bangs hanging almost to their eyebrows and pigtails in the back, except for two more frivolous ones whose bangs are curled, with their hair hanging loose over their shoulders. The girls and younger boys all wear long dark stockings and high buttoned shoes. The younger boys are in tight knee length trousers with jackets buttoning straight up the front to the line of their collars. The older boys are similarly dressed except that their trousers are long tight ones. Three of the more unconventional lads have discarded their jackets and have loose low collars, in contrast to the high starched ones on many of their companions. For the most part the girls are dressed in rather shapeless plaid gingham dresses with skirts half way to their shoe tops, though a few are dressed up for the occasion in what was then known as “all over embroidery”. The nurses are in neat uniforms with white aprons. 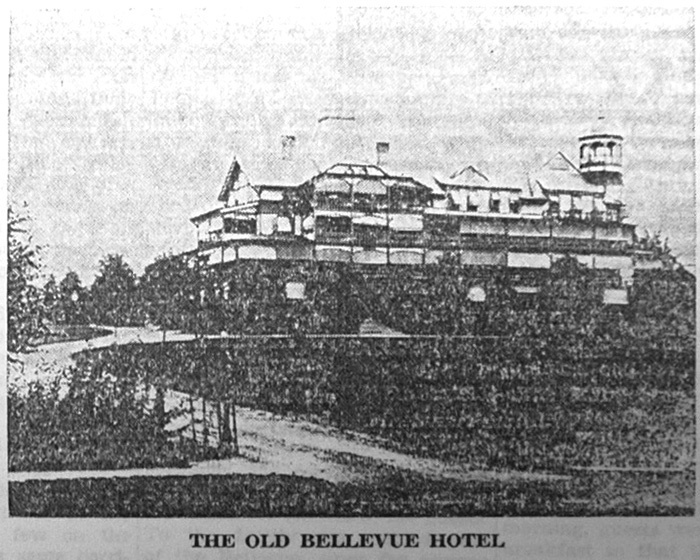 Seated among the other small girls on the lowest step of the porch is a dark haired, bright eyed youngster easily recognizable as Mrs. Davis, then small Mary Arms, who has given your columnist the material for this story of the old Bellevue Hotel. Among other rooms on the main floor of the old Bellevue Hotel, in addition to those described in last week’s column, by Mrs. Davis and as shown in Dr. Arm’s sketch, was the bakery just back of the kitchen. In it were the built-in ovens and the closets which held the barrels of sugar and flour, as well as containers of fine extracts that went into the making of French pastry and macaroons for which the hotel cuisine was famous. Huge ice boxes were also back of the kitchen. While most of the bedrooms were on the upper floors of the hotel, there were a few on the main floor along this same corridor that housed the card rooms, parlors, play room and bicycle room. Bedrooms on the second and third floor had their own porches with find views in all directions. Strange as it may seem nowadays, none of these rooms had private baths, although each was provided with a wash stand, bowl and pitcher. On each floor were several bathrooms, which were kept locked except when a boarder asked for its use. When such a request was made, it was accompanied by a fee of 25 cents, given to the chambermaid, or by a green ticket which had previously been obtained from the hotel office. It was the duty of the chambermaid to prepare the baths and to straighten up the bathrooms afterwards. Mrs. Davis tells an amusing story in connection with a bath taken one afternoon by “Katie”, a beautiful and vivacious girl who was summering at the Bellevue. Bathrooms were on the side of the the hotel facing the tennis courts, where in the afternoons the young men, attired in their natty white flannels, would play their matches, while the ladies would watch from under the shade of their parasols as they sat in chairs on the lawn. If the old Bellevue lacked the modern convenience of private baths, it far exceeded present standards in the bounty of its table, which was unsurpassed in a time that excelled in variety and quality of food. Unfortunately, none of the old menus has been preserved. They were enticing enough to keep whole families contented from June until September, while another set of boarders usually arrived in October from visits abroad, to remain there until their town houses were prepared for winter occupancy. “The afternoon driving was almost a ritual for the women”, Mrs. Davis continues. “The bonnet you should wear depended on which type of carriage you were driving. The lady who was the most elegant had for bonnets. One from last year was worn to drive in the Germantown, a still better one was for the Victoria driving–a little lace parasol with it. And then there was her Sunday bonnet! The lady’s daughter, aged 17, had her horse and dog cart with a footman in the rear seat. She wore out twelve long pairs of white kid gloves while driving during the summer, which her mother thought quite extravagant”. There were many beautiful drives around Wayne then, as there are now. These afternoon drives usually started about half past four with the men often accompanying their wives. The former frequently came home from business soon after lunch in order to have their afternoon naps. Usually an hour’s time would suffice for these drives, after which the couples would return tot he hotel where they would sit quietly on the porch until dinner time. The young people mostly had their own dog carts and horses. After dinner there were the whist games. Once a week progressive euchre parties were held when each guest paid 25 cents to pay for the three prizes that were awarded. “These parties”, Mrs. Davis writes, “were quite gay affairs for the older people”. On Wednesday evenings there was always concert music while on Sunday evenings there was hymn singing in the parlor for those who cared to come. Most guests retired early, being in bed usually by half past ten. Before that the bell-boys would be busy answering the bells ringing in the big rack on the wall by the office. For pitchers of ice water were always in demand. And then “the night settled down”. And by eight o’clock the next morning, guests were having their breakfast so that the men of the family could catch the 8:12 Paoli Express to Philadelphia. One of the most beautiful and impressive buildings that has ever been erected in Wayne is but a legend now – the Bellevue Hotel built in the summer of 1881 by George W. Childs and A. J. Drexel. For not quite nineteen years it stood on the high slope of ground overlooking Lancaster Pike at the intersection of what is now Bellevue avenue, its wide porches looking out on the surrounding countryside. And then on a bitter cold night in January, 1900, the hostelry, famous for two decades as the summer home of wealthy Philadelphians, burnt to the ground. It has never been rebuilt. But a few years later William W. Hearne erected his home on very nearly the same site. This is the building now occupied by the Helen Kellogg Dining Room at 125 West Lancaster avenue. In the 1880’s and 1890’s there were several famous summer hotels along our Main Line. Among them, in addition to the Bellevue, were the Bryn Mawr Hotel, now the Baldwin School; White Hall, on old Railway avenue in Bryn Mawr; Louella Mansion on Lancaster avenue in Wayne, and the Devon Inn in Devon. 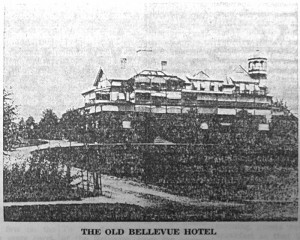 The Louella, built in 1867 by Henry J. Askin as a home for his young family, had become a summer hotel by the middle seventies, thus antedating the Bellevue by several years. But of all the hostelries none has been more famous for the aristocracy of its guests, the beauty of its surroundings and the comfort and luxury of its appointments, than the Bellevue in the brief years of its existence. The story of summers in the old hotel has been graphically described to this columnist recently by a man and a woman who livd there as children in the decade between 1885 and 1895. They are Dr. George W. Arms, a retired Presbyterian minister now residing in Lansdowne and Mrs. Horace J. Davis, of Wallingford. They are grandchildren of Mrs. Mary Berrell Field who purchased the Bellevue from George W. Childs in 1885. With their father and mother they lived at the Inn for ten years of their childhood. For all of those ten years small George attended Sunday School regularly at the Wayne Presbyterian Church. “Undoubtedly during that time,” he writes, “seed was sown which developed into a Presbyterian preacher of now over 45 years. Some of my playmates, if they should remember me and my name, wonder at the grace of God.” Dr. Arms also attended the public school in Wayne and remembers “the four room gray stone school that was built near the present school location”. George H. Wilson was then the principal. Mrs. Davis and Dr. Arms tell of the Philadelphia families who would leave town early in the spring to avoid the heat of the summer and to spend a restful time at a hotel “in the country”, as they considered the present suburb. Town houses would be closed and families would “board the Main Line train for Wayne”. But before they did so, furniture was protected with linen covers, mothballs were scattered over the rugs and trunks were packed in readiness for the call of the Adams Express Company. Once in Wayne, the took up commodious quarters in the Bellevue Hotel, which was a charming hotel built of frame, four stories high, with broad porches running across each floor. The second and third floor porches were divided by white railings, for each room had its door leading out onto a private porch. The hotel with its large lawns was set back from the Pike. Up from the Pike was the U-shaped drive tot he front door. A small summerhouse, covered with honeysuckle, stood half way up the drive. (This small building somehow escaped the fire, and is still standing, the sole remainder of a day now long past). On the lawn to the right of the hotel was a small stone house with high domed roof, long stained glass window on the side and porch running across the front. In it were the billiard and pool tables. At the side and rear of the hotel were the tennis courts and croquet grounds. A shaded walk with flowering bushes led down to Wayne Station. In back of the hotel was the servants’ cottage, on the lower floor of which was the laundry room where all the laundry of the hotel and of the guests was done. By the side of the cottage was the large ice house, supplying the ice for the hotel. Every winter the ice was drawn from Martin’s Dam on long wooden sleds. Sawdust was packed in the ice house with the ice to keep it solid. After the house was filled, the doors would be locked and not opened until the following spring. Up the broad steps and across the wide front porch was the entrance tot he Bellevue. The front hall ran back to the dining room. On one side of the hall to the left was a small library with a white mantelpiece, with a beautiful brass fire set beside it. At the end of the room were doors that opened onto the porches. On the right side of the hall was the parlor with three wide doors opening out on the front porch. The floor was covered by a gay carpet, there was the mantel with its mirror, and at the end of the room a long wide mirror from floor to ceiling which reflected the small sofas and chairs. it was a rather severe and formal room with its piano, a few ornaments and pictures. Down a side hallway, running the length of the house, was the card room for the men. When whist was played in the evenings never a word was spoken. Across the hall was another card room, this for the ladies. The dining room with its windows on each side was a large and cheerful room. There the Saturday evening hops were held each week. In back of the dining room was the kitchen. One side of it was covered with high iron ranges, in front of which was the carving table with a frame over it, from which hung the carving knives. It was as long as the range. The steam table and dishes and the pantry were on the other side of the room. So vivid was the impression made on the mind of small Mary Arms during a childhood spent at the old Bellevue Hotel that she is able to present this word picture of it now, may years later. And Dr. Arms has even drawn to scale both interior plans of the Hotel and an exterior view showing the buildings and its grounds. Conestoga wagoners were a rugged lot who competed ruthlessly among themselves for the business of the road and the right-of-way. Yet the majority were honest, industrious and thrifty, loyal to the traditions of their calling. They were proud of their teams, their wagons and their work. It is said that many of them refused shelter from the weather themselves if their teams had to remain unsheltered. Among themselves they held to a code of courtesy as evidenced by the fact that when they stopped at wagon stands on cold winter nights the younger men deferred to the older ones by giving them the best places near the fire in the “common” room. All slept on the floor on narrow mattresses of shoulder width which, with their blankets, they packed in their wagons while they were on the road. On pleasant nights they usually slept outdoors. At the wayside hostelries the wagoners drank, sang and danced. Old Monongahela whiskey was three cents a glass, two for five, while a meal cost about twelve cents. They smoked long and somewhat rank cigars which sold four for a cent and were called “stogies” because of their popularity among Conestoga wagoners. In the early days of the Turnpike, sharply defined lines were drawn between the various classes of wayside taverns. Those of the better class, such as the famous Spread Eagle of Strafford’s early days, were known as “Stage Stands”, those taverns patronized by wagoners and teamsters. Before the time when these hostelries of various types became frequent along the highway, travelers secured entertainment at private homes. Conestoga wagoners ordinarily wore plain suits of homespun wool, blue cotton shirts and broad-brimmed hats. For the most part they spurned underwear and stockings, their feet bare in their high leather boots or in their “stogy” shoes, so named for the wagons they drove. Since each teamster manned a vehicle hauling two to six ton loads, they were necessarily men of prodigious physical strength. Among the wagoners’ feats of strength were these: lifting a hundred pound keg of nails out of the wagon by grasping the narrow edge of the keg between the fingers and thumb of one hand; unloading a six hundred pound barrel of molasses singlehanded; walking off with a half-ton of pig iron to win a wager; handling a 56-pound weight with the ease of a gymnast throwing a dumbbell; and lifting a wagon off its four wheels by lying under it and pushing upward with both hands and feet. Some of these feats seem as fantastic in the telling and as unlikely as some of the tall tales exchanged around the blazing log fire in a wayside tavern. In addition to their story telling these wagoners were known as singers of ballads and drinking songs as they stood around the wayside barrooms. To the accompaniment of fiddle, accordion or banjo they sang such favorites as “Little Brown Jug”, “Ach, du Lieber Augustine”, “The Arkansas Traveller”, “Turkey in the Straw” and many others. In addition to singing their traditional ballads, wagoners made up their own songs to long familiar tunes. “Pennsylvania Songs and Legends” gives the texts of many of these new ballads, improvised from old ones, among them parodies on “Jordan Am a Hard Road to Trabbel”, “Lieber Heindrich” (Dear Henry) and “The Farmers’ Alliance”. As these wagoners traveled beyond their native counties of York and Lancaster they swapped songs and stories with the people they met along the road, thus accumulating a vast store of folklore. Apparently no particular attempt was made to record this folklore while the original wagoners were still on the road. What has come down to us has been mostly through the memories of their sons and grandsons. Even the original source of the name “Conestoga” is not clear, although it is supposedly the Indian equivalent of “Great Magic Land”. In a map of the lower Susquehanna valley dated 1665, there is a stream of water named “Onestoga”. There is also an early tribe of Indians designated as “Conestoga”, as well as a manor in Lancaster County. All these antedate the Conestoga wagon and the Conestoga horse which, according to tradition, were named for the section of Lancaster County where they probably originated. Even the Philadelphia – Lancaster turnpike was for a time called the Conestoga Road because it was the favored route of Conestoga freighters. In 1792, the Philadelphia and Lancaster Turnpike Company was chartered and two years later America’s first hard-surfaced road was completed, at a cost of $465,000. The route of the Turnpike was virtually that of the old King’s Highway, which at some points it paralleled and at others it crossed. Nine toll gates were set up along the route to collect from wagons and stage-coaches a specified toll, based on the number of horses and width of tires. By 1798 a nine arch limestone span bridge was finished over Conestoga River, thus completing the last mile of the new highway. This new road “eliminated much of the hardship of travel – and some of its color, too”, to quote from “Pennsylvania Cavalcade”. Faster travel was possible and lighter vehicles came into popularity, “foreshadowing the doom of the massive Conestoga wagon”. Then in the middle of the nineteenth century canals presented a new method of transportation, and only a little later the first railroad between Philadelphia and Lancaster was in operation. The deep resentment of the teamsters over this encroachment on their domain was expressed in bitter fights in taverns between railroad laborers and teamsters. But eventually it became plain to even the wagoners themselves that their wagons were superseded by the canal and the railway. It was then that the merry songs of this stalwart group were changed to this last unhappy one: “Oh, it’s once I made money by driving my team, but now all is hauled on the railroad by steam. May the devil catch the man that invented the plan, for it ruined us poor wagoners and every other man”. For her information for this series of articles your columnist is indebted to “It’s an Old Pennsylvania Custom”, by E. V. Mitchell; “Pennsylvania Songs and Legends”, edited by George Korson; “Pennsylvania Cavalcade”, a Pennsylvania writers publication, and “The Wayside Inns on the Lancaster Roadside”, by J. F. Sachse.